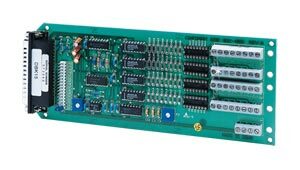 Each OMB-DBK15 multiplexing input card provides sixteen channels of current or voltage input to OMEGA’s OMB-LOGBOOK and OMB-DAQBOARD-2000 Series data acquisition systems. An OMB-LOGBOOK and OMB-DAQBOARD-2000 Series can accept up to 16 OMB-DBK15 cards, for a total of 256 potential analog input channels per system. The OMB-DBK15 features a 16-channel multiplexer and a programmable gain input amplifier. Its durable component sockets accept resistors that configure each channel for either current-to-voltage conversion or for voltage attenuation. The OMB-DBK15 is supplied with sixteen precision 250 ohm resistors for making 4 to 20 mA measurements, and sixteen sets of 6:1 voltage dividers for accommodating up to ±30 V* inputs. The OMB-DBK15 can also accept other, user-supplied resistor values, facilitating user-selectable current-to- voltage conversion or voltage attenuation factors. When employed without resistors, the OMB-DBK15 provides sixteen differential voltage inputs, which accommodate ±5 V full scale inputs. The OMB-DBK15’s input amplifier is software programmable for x1 or x2 gain per channel, and for unipolar 0 to +10 V or bipolar -5 to +5 V input per channel. Voltage Measurements. The OMB-DBK15 accommodates voltage measurements beyond the standard 10 V range, accepting voltage divider resistors for up to ±30* VFS inputs. You can obtain any combination of input ranges by simply installing the appropriate resistor combination on the OMB-DBK15 card. The card’s on-board programmable gain instrumentation amplifier (PGIA) can be set for a ±5 V output span or a 0 to +10 V output span, allowing users to set the OMB-LOGBOOK or OMB-DAQBOARD-2000 Series for either configuration. Current Measurements. The OMB-DBK15 is ideal for accommodating transducers with 4 to 20 mA output; one need only install the 250 ohm resistors provided in the appropriate location on the board.